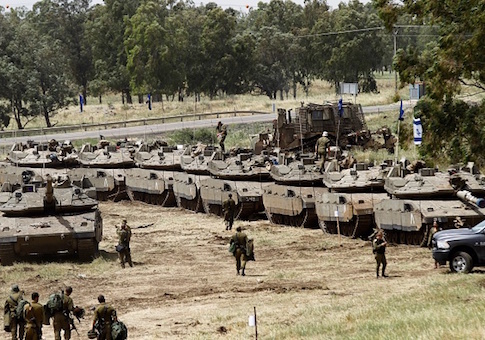 The Golan Heights territory, which separates Israel from Syria, has become more strategically important since Iranian forces have moved into Syria to fight on behalf of embattled President Bashar al-Assad and arm jihadist fighters opposed to Israel's existence. DeSantis expressed frustration and confusion as to why the Golan measure was denied a vote, telling the Free Beacon that U.S. recognition of Israeli sovereignty over the land is particularly pressing as Iran marches across the region. The measure also had won support in the Senate from Ted Cruz (R., Texas), who has long urged United States recognition of Israel's control over the Golan area. "It is past time for the United States to recognize Israel's sovereignty over the Golan Heights, which the Israelis gained decades ago while fighting a war of survival against hostile neighbors," Cruz told the Free Beacon. "The Golan Heights are a strategically critical bedrock that is necessary for Israel's security." "On the other side are terrorist organizations such as Hezbollah and the troops sent by the Iran's regime, which is committed to Israel's destruction," Cruz said. "A strong and secure Israel is indisputably in America's national security interests, and Israeli sovereignty over the Golan Heights is necessary to both." Senior congressional sources with knowledge of the situation blamed Republican leadership in the House for failing to stand firm on key foreign policy issues such as efforts to bolster the U.S.-Israel alliance. Some sources went so far as to allege that some officials in the Trump administration urged Republican House Speaker Paul Ryan (R., Wis.) to prevent the Golan measure from receiving an up or down vote. The current National Defense Authorization Act, or NDAA, a mammoth spending bill that sets up the United States' foreign policy priorities, "is conspicuous for how few major policy battles were fought—almost all due to Republican leadership refusing to allow debate and votes on a host of key issues," said one senior congressional official intimately familiar with the matter. "It's like they chose to punt on second down." Ryan's office did not respond to multiple Free Beacon requests for comment on why the resolution was nixed. Senior White House official's who spoke to the Free Beacon on the matter denied playing any role in the debate, saying officials only recently became aware of the DeSantis resolution. An National Security Council spokesperson told the Free Beacon that it is working to foster a comprehensive peace agreement that accounts for all territorial disputes. "The President has made his position on new settlement activity clear, and we encourage all parties to continue to work towards peace," the official said. "The Israeli government has made clear that going forward, its intent is to adopt a policy regarding settlement activity that takes the President’s concerns into consideration. The United States welcomes this. As the President has said repeatedly, the Administration is firmly committed to pursuing a comprehensive peace between Israelis and Palestinians.". Israeli officials discussed the larger issue of Golan and security in past meetings with White House officials several months ago, but there has been little discussion of the issue since then, a senior administration official told the Free Beacon. The White House still has not taken a position on the issue. This entry was posted in National Security and tagged Golan Heights, Israel, Ron DeSantis. Bookmark the permalink.